As published in a recent Austin American-Statesman article, the Texas Department of State Health Services (DSHS) is now claiming that there were two small outbreaks of foodborne illness linked to raw milk in the spring of 2015. But this is the first time in the year and a half since the outbreaks happened that the agency has said anything about them. The article raises far more questions than it answers. The investigating authority first asks each person to list everything they ate or drank in the days before they got sick. As you can imagine, people’s recollection is often incomplete, especially when they’re sick. So the lists may or may not include the food product that had the bacteria. If the health department is able to identify a common food consumed by each of the affected persons, they then attempt to trace the food product to the farm or food manufacturer where it was produced. In the case of the industrial food system, this is often impossible because of the complicated supply and distribution chains; but with food sold direct to consumers, it’s much easier. The health department then takes samples of the food product (and sometimes the environment) to test. Whether or not they find bacteria in the food, the health department takes steps to notify potentially affected consumers, through a public notice, having the producer issue a recall, etc. In the case of illnesses suspected to be due to raw milk, the health department has always taken the opportunity to publicize the alleged link to raw milk and urge people yet again to only drink pasteurized milk. The outbreaks allegedly occurred in March and April of 2015, when DSHS staff were testifying to the Legislature during hearings on the 2015 raw milk bill. Yet agency staff, testifying under oath, did not say a single word about these supposed new outbreaks. 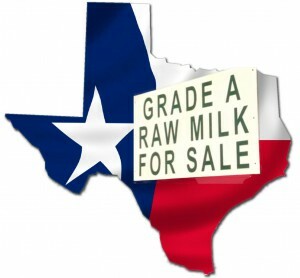 These outbreaks would be the first ones linked to raw milk in Texas in five years. When DSHS suspected raw milk of causing four illnesses in 2011, it notified the media and testified at length to the Legislature about the alleged link to raw milk. This time, with two separate outbreaks and seven illnesses alleged, DSHS said nothing. Based on what we have been able to find out so far, DSHS never notified the dairies that they were alleged to be the source of illnesses nor conducted any testing other than the usual inspections that licensed dairies are always subject to. And DSHS never notified the consumers or public. When FARFA’s Executive Director wrote an opinion piece, published in the Austin American-Statesman in late July, about DSHS’s heavy-handed tactics towards raw milk farmers and consumers, she cited a statistic that only six illnesses linked to raw milk had been reported in Texas in the last 20 years. Despite the fact that DSHS staff monitor our email blasts, no one from DSHS contacted us to say we had failed to account for the alleged 2015 illnesses. And over the last several months of intense discussions and heated debates about raw milk, the agency never mentioned these outbreaks. It was only after Representative Dan Flynn, joined by a dozen other legislators, used the same statistic in a letter to DSHS complaining about the agency’s inappropriate behavior that the agency finally made its claim about the 2015 illnesses. Rep. Flynn’s letter happened to pique the interest of the Austin American-Statesman’s PolitiFact reporter, who happened to question the letter’s statistics on raw milk illnesses (ignoring the far more interesting claims about the agency’s abuse of authority). It was pointed out to the reporter that the alleged 2015 illnesses were not listed on public reports as of July 2016 but suddenly appeared around the time Rep. Flynn circulated his letter to his fellow legislators to sign on to. The reporter, however, ignored the suspicious timing of these events. He simply regurgitated, without any question or criticism, DSHS’s strange statement that information related to these illnesses was available to anyone who asked — even though DSHS had said nothing in almost a year and a half since the illnesses occurred, and people don’t generally inquire about the absence of a problem. The federal Centers for Disease Control (CDC) confirmed that the information only became publicly available in its online database on September 1 of this year. In other words, when Rep. Flynn wrote the letter and circulated it to other legislators in August, he was working from the information publicly available at that time — and DSHS didn’t tell him about these additional illnesses, even though staff were aware of the contents of the draft. Not only did the Austin American-Statesman reporter fail to scrutinize DSHS’s claims about the illnesses’ alleged link to raw milk, but he filled his article with irrelevant information that appears to be intended to imply that raw milk is dangerous. He quoted the number of illnesses allegedly linked to raw milk in the whole country, without putting them in the context of the hundreds of thousands of foodborne illnesses that are caused by all types of other foods. He ignored the fact that Rep. Flynn’s letter was focused on the situation in Texas, where raw milk is legally sold from licensed, inspected dairies under state-specific regulations. He discussed a CDC report that claimed raw milk is high risk — and only briefly mentioned that the same report didn’t find ANY illnesses in Texas in the time frame it addressed. This isn’t a fact-check piece. It’s propaganda. Send a letter to the editor of the Austin American-Statesman to set the record straight! The maximum length of a letter to the editor is only 150 words — just a few sentences. So pick one or two points that matter the most to you, and put them in the context of your own experience and perspective. Letters to the editor MUST be in your own words. If the newspaper gets letters that are substantially the same, they will not only disregard the extras, they will most likely not print any of the letters on the topic. SUBMIT your letter at http://www.statesman.com/opinion/letters/form/. Please also send a copy to Judith@FarmAndRanchFreedom.org, so we know how many have been submitted to the newspaper. Whether there have been 6 illnesses or 13 illnesses, neither is a significant number over a period of 20 years in a state the size of Texas. There were thousands of foodborne illnesses reported in that timeframe in Texas, from all sorts of foods. Briefly share your personal experiences with raw milk, from a perspective of the safety and/or the benefits you’ve seen. If you’ve gotten sick from other foods, you can use that as a contrast. All food carries a risk. If you’ve had any experience with the health department harassing you or your farmer, please share your story. 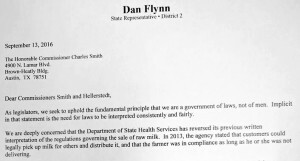 The main point of the letter sent by Rep. Flynn was that the health department needs to stop harassing people buying raw milk from licensed dairies. The health department’s claim that the information was available if people asked them is absurd. Why would someone inquire about supposed outbreaks that had never been publicly reported? Meanwhile, the department has been involved in numerous discussions in which the existence of these alleged outbreaks would have been directly relevant, but never mentioned them. The real issue isn’t whether there were 6 illnesses or 13 illnesses, but why the health department is claiming a link to raw milk without having done a full investigation or notifying the public in a timely manner. Please do NOT cut and paste these talking points into a letter to submit. Pick one or two of the ideas expressed in them — or choose another aspect of the issue that’s important to you — and write your own letter. It truly makes a difference!